At the beginning these 4 pieces: the rug, chest, mirror, and floral painting where what pulled this space together. I found the rug at my parents home in Houston and crammed it into a suitcase and flew it to Kansas. 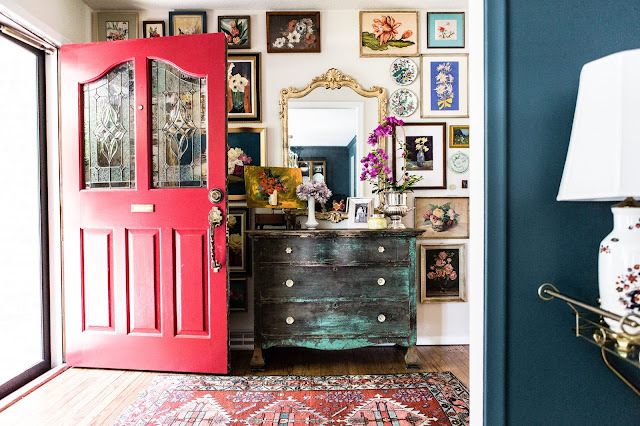 I loved the colors of the rug and thought surely it would work with the old chest my father-in-law had found on a piece of his property. The chest was left behind in a shed and was falling apart (missing knobs and feet), but, it was free! So the chest was refurbished, knobs and feet added, glued together by my father-in-law, and it was good to go. I stole the mirror from another room and hung this fun floral. The first floral canvas I found was this bright blue background piece. It ended up being a perfect fit because its colors flowed perfectly with the natural, faded, color of the chest and matched the wall color in the room it faced - the living / dining room. 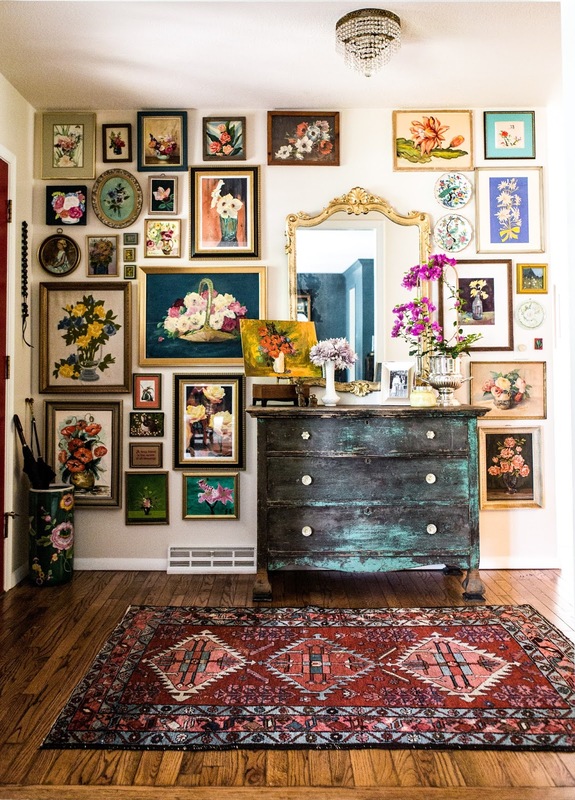 It was from here, along with the encouragement of a dear friend, that the gallery wall began. 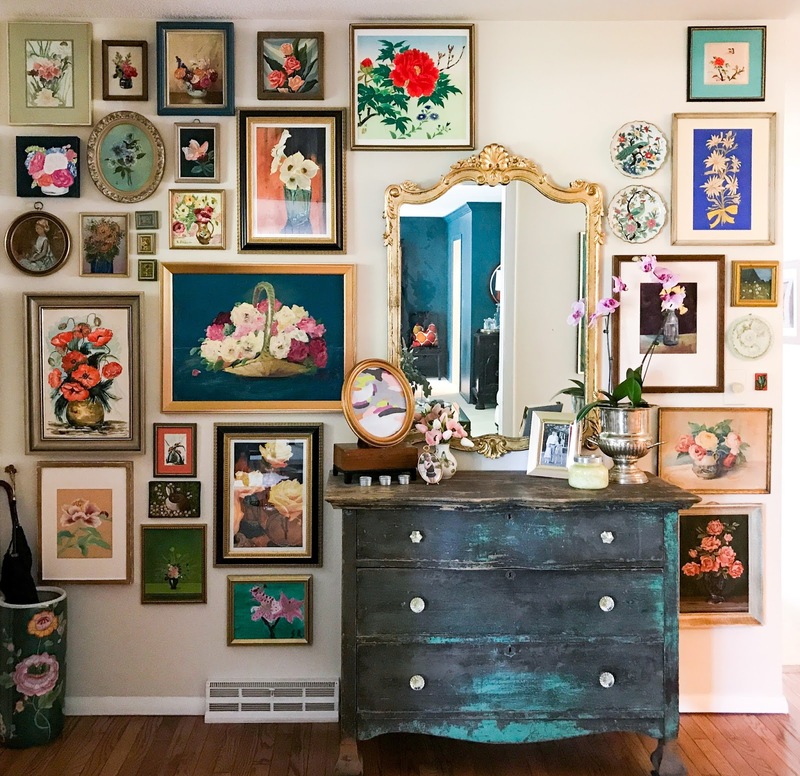 It took about 2-3 years of finding artwork from family, friends, thrift stores, estate sales and garage sales to finish the wall. Three of the paintings are by my father, four from my grandmother, one from my brother and two from dear friends. This the final shot of the entry before we moved. I miss this spot dearly and hope to recreate something similar in our new home. Thanks for stopping by! ALSO A HUGE thanks to Alison Moore Photography for taking this lovely photo. 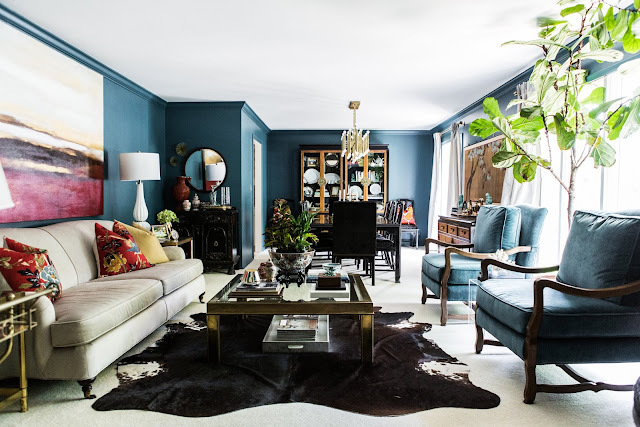 In fact, she took all the images for our Design*Sponge Home Tour which you can find HERE. I can't say enough good things about Alison and her mad photography skills! Check out her website for more info! Hey, Hey! 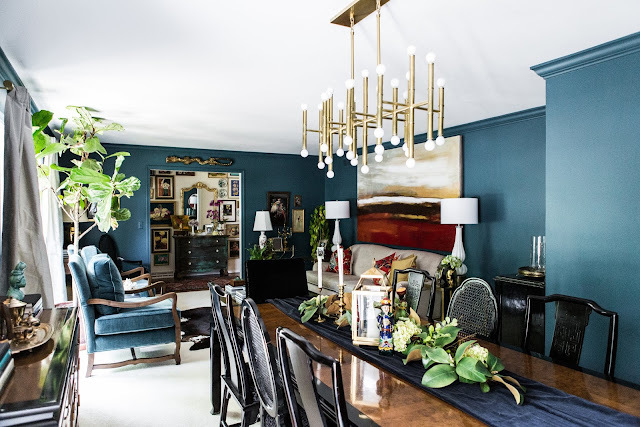 Today I'm talking about the Living/Dinning room from our Kansas home. 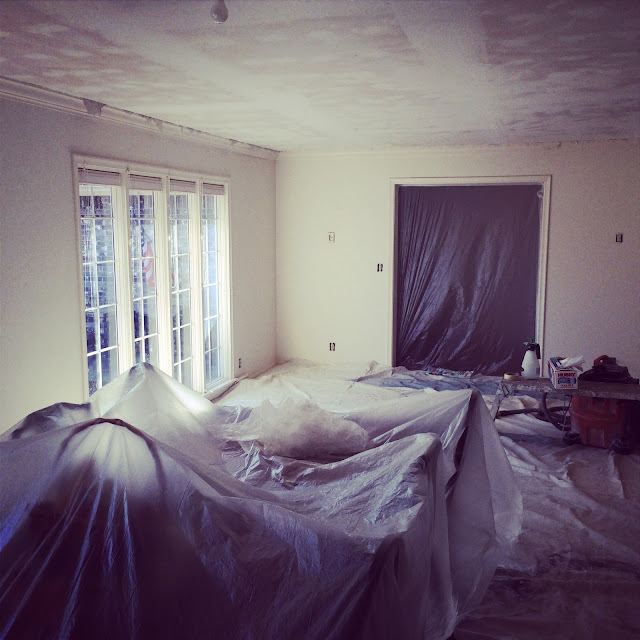 Scroll down to see the before pictures- it was originally a dull neutral off-white color with popcorn ceilings. We painted almost the whole home in Sherwin Williams paint. We lived in their stores. 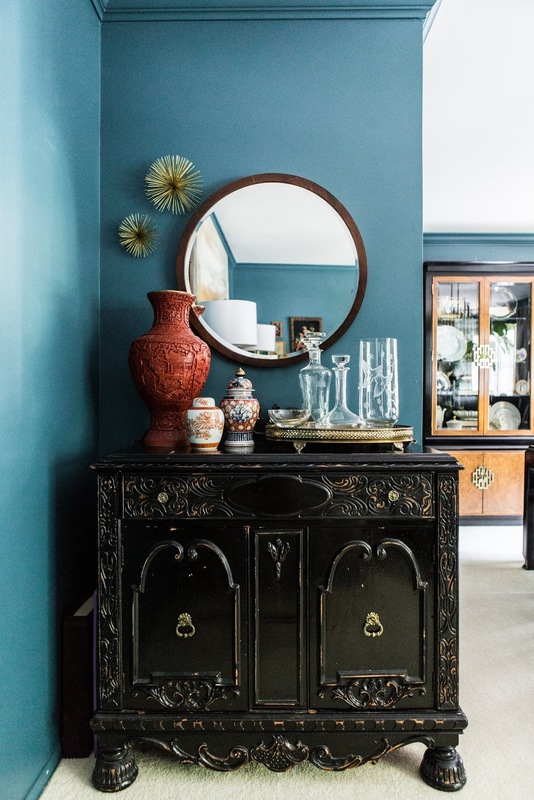 My husband came across the paint chip "Deep Sea Dive" and was hooked. It was the only color we sampled on the wall. Love at first sight. Little Vignettes, like this one, I carried over to our Connecticut Home. My partner in Styling Crime @alittlewhitemouse suggested I style the dinning hutch with decorative items versus the typical showcase for serving pieces. Her idea was to go with a bookcase feel since you saw the hutch the second you walked in the room. I kept saying I didn't want the cabinet to look like a "granny China Hutch". I wanted it to be different. 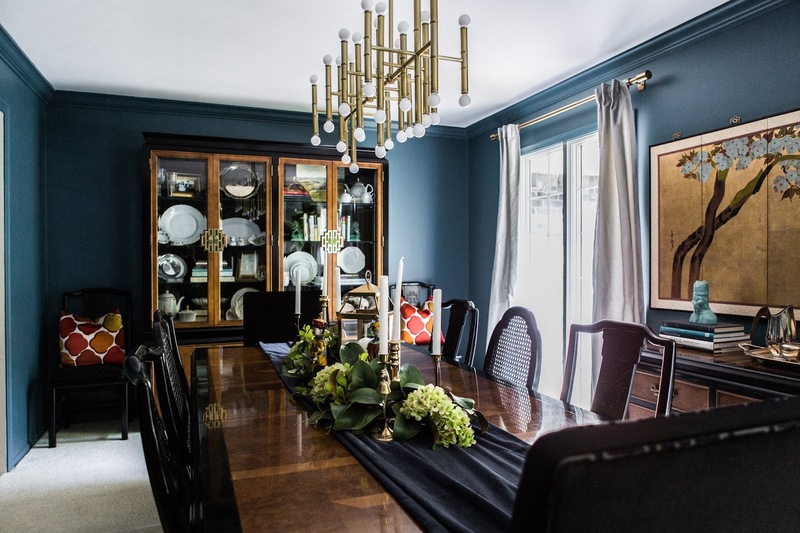 The Dinning room set is by Century Furniture and was designed by Raymond Sobota for the Chin Hua Collection. 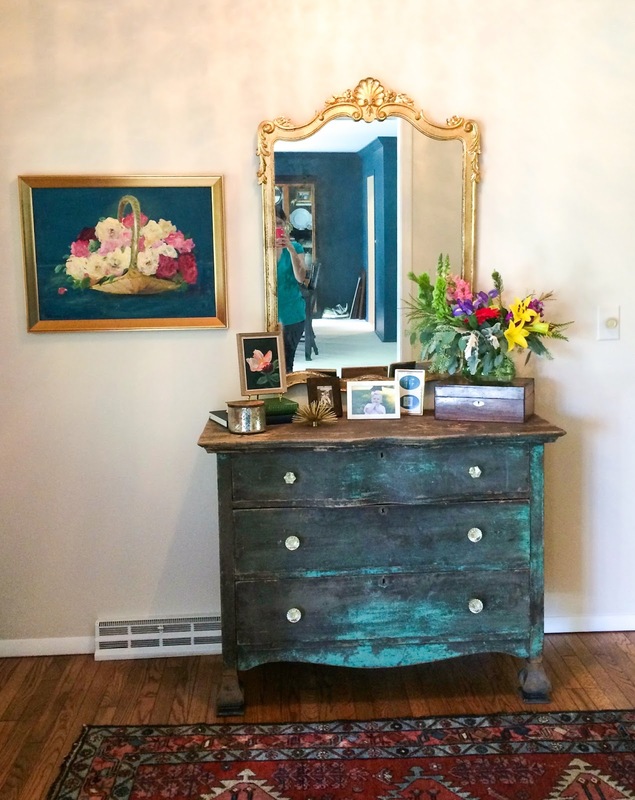 You can often find it on 1stdibs or sometimes score a set on Craigslist, like we did. 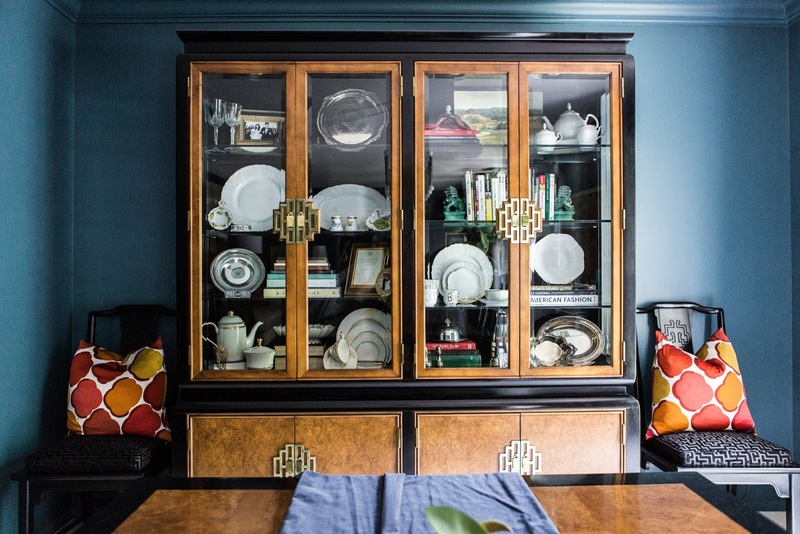 Using our travel books, china, and artwork to style the cabinets gave it more of a bookcase feel. 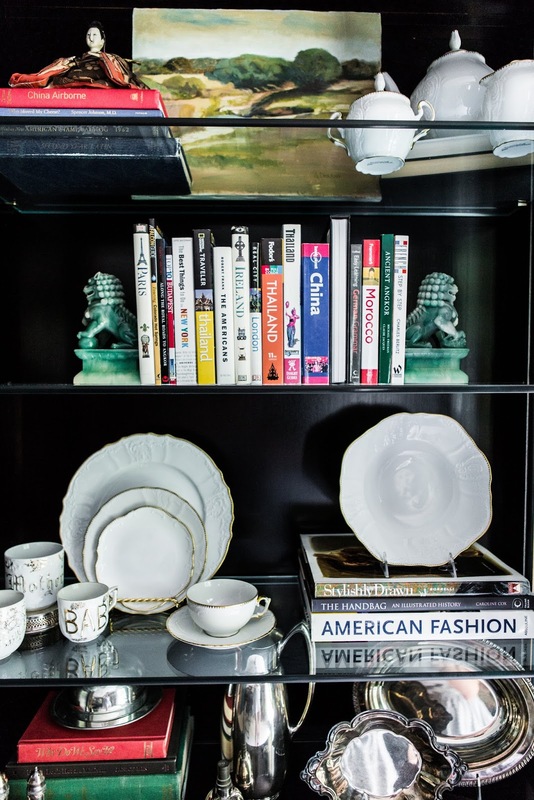 The China doll on the top left is a gift from a dear friend and sits atop my husbands Chinese business books. Symbolic since he's obsessed with China and his work takes him there. 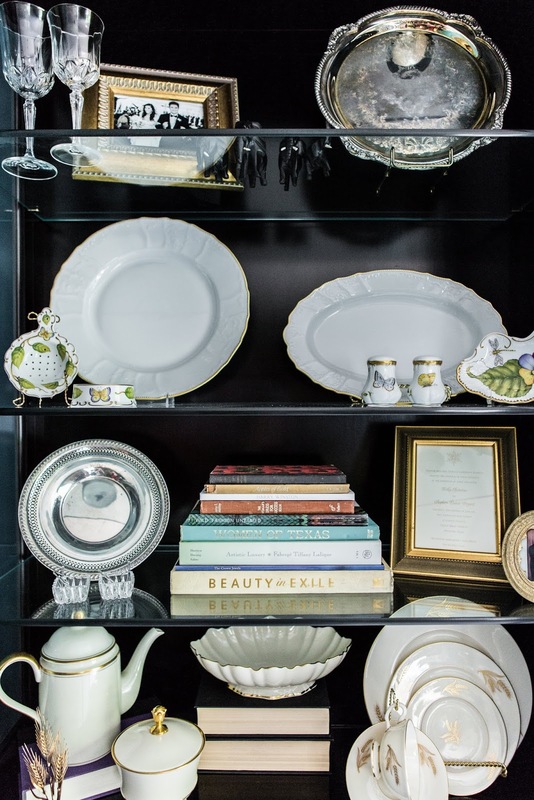 I also worked in our wedding invitation, my Grandmother's china and a photo from our wedding. A last look of our Dinning room looking into the entry. 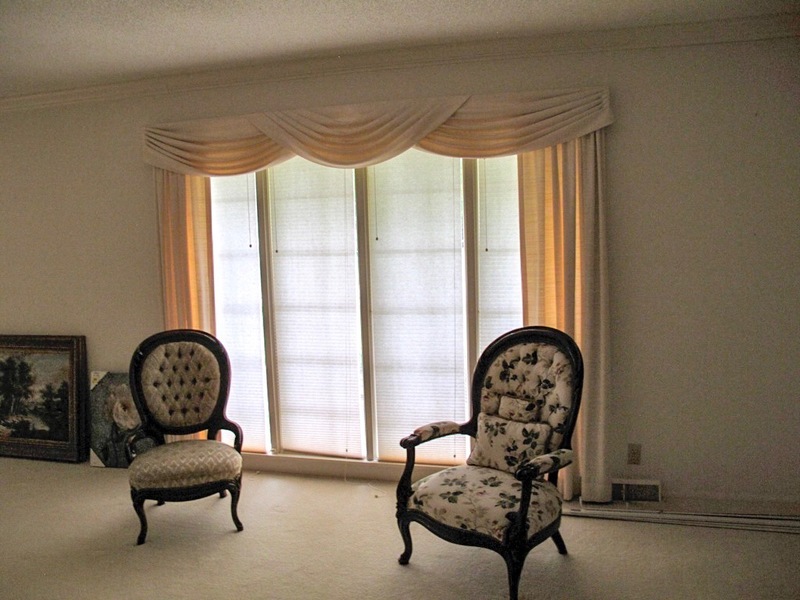 This was the living room before we purchased the home. We immediately took the drapes down and removed the popcorn from the ceiling but it took months to repair the ceiling and decide on a new paint color. I have loved styling my girls bedrooms. 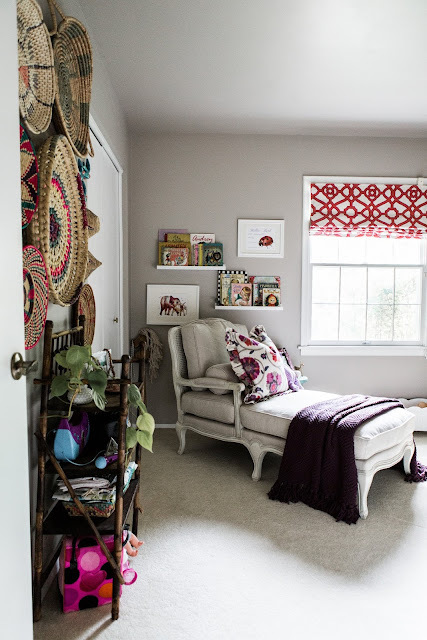 My friend and Interior Designer, Lauren Johnson, helped me pick out the canopy, pillow and roman shade fabric for this room. 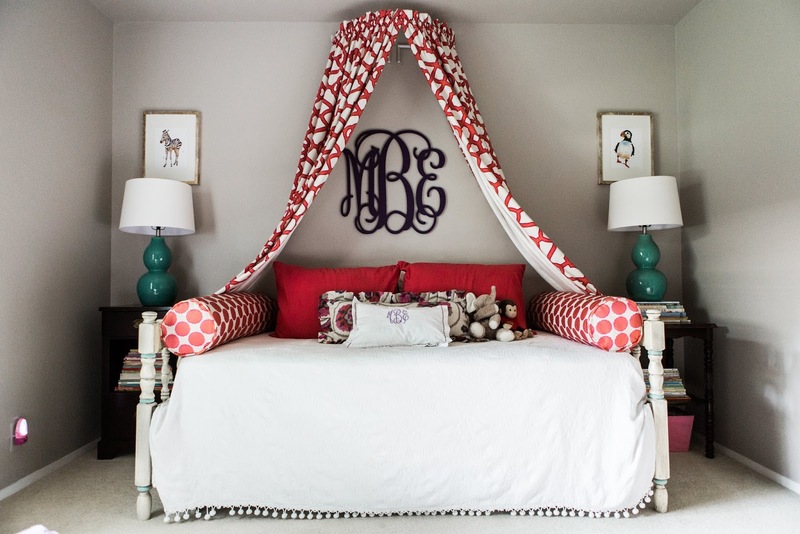 We used this same look for her nursery and it made an easy transition into a big girl room. 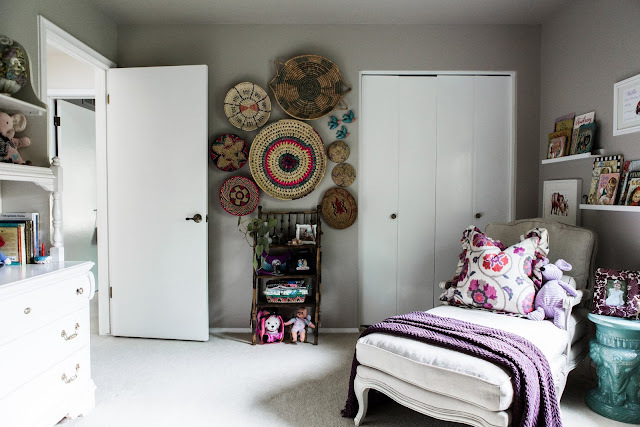 The other half of the room was a fun natural design process. 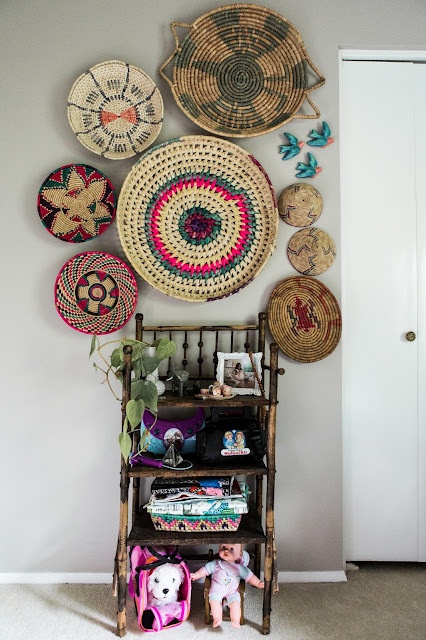 I slowly kept coming across African Baskets and was able to create this feature wall. This Bamboo shelf was a gift from a dear friend and has come in handy when storing toys. 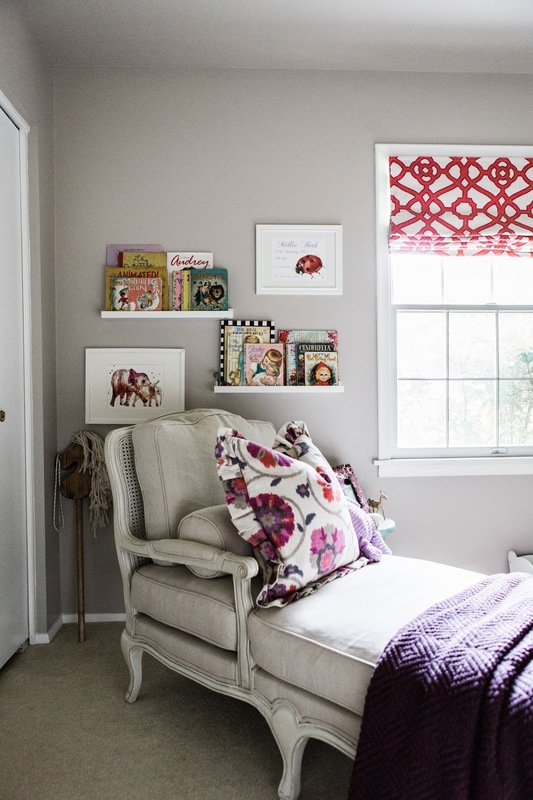 These Ikea book shelves were the perfect touch of decor for over the chaise lounge. A fun way to showcase vintage books I found and they're just high enough that she can't rip them apart- ha ha! 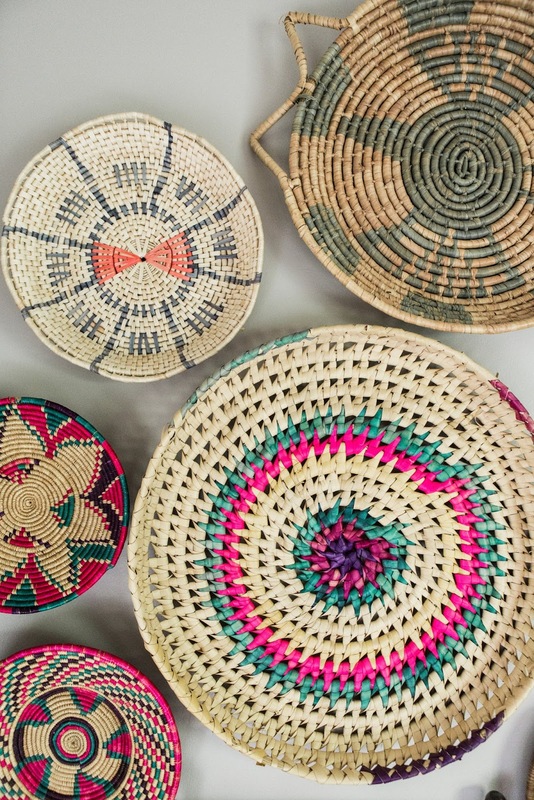 A close up look at the baskets. The Wall color is "slate" by Restoration Hardware. Thanks for stopping by!